Grizzly Bear on the Iceberg Lake Trail in Glacier National Park. 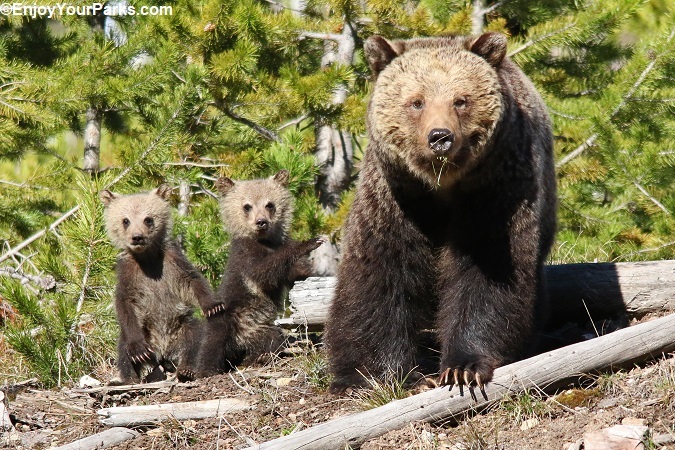 Grizzly bear sow and cubs along a trail in Yellowstone Park. 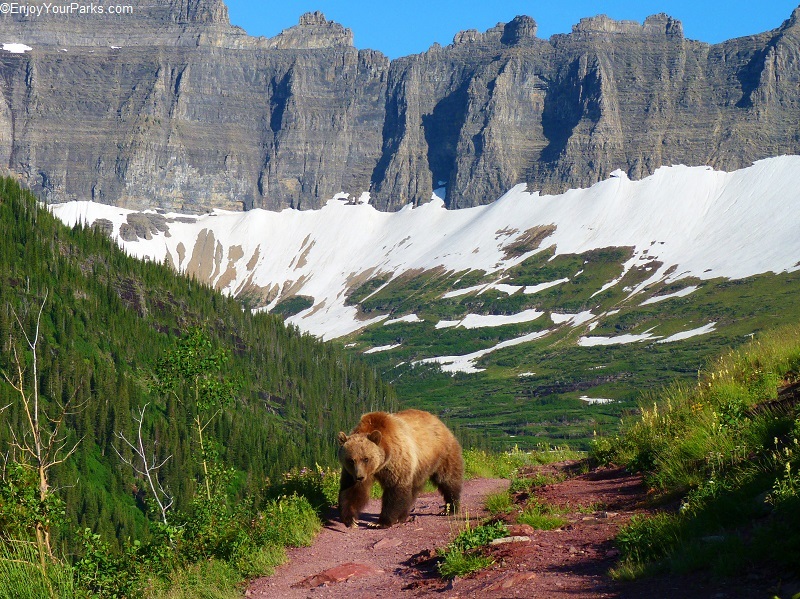 Hiking In Grizzly Bear Country is commonplace in the Northern Rockies, as Glacier National Park, Yellowstone National Park and Grand Teton National Park are home to hundreds of grizzly bears. 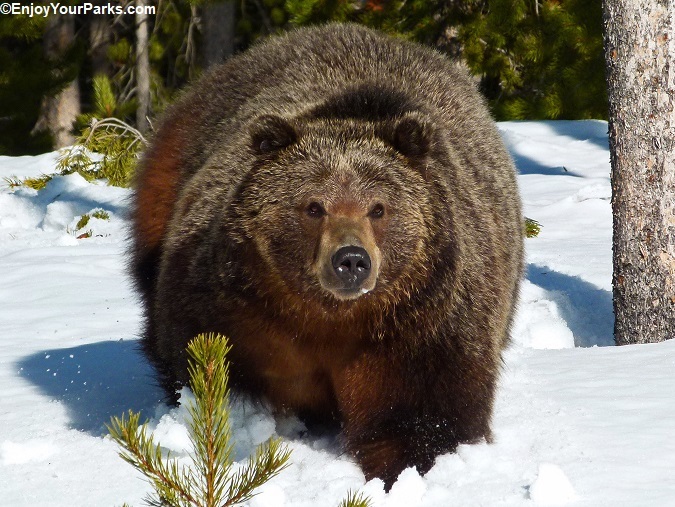 By knowing some basic "rules" while hiking in grizzly bear country, you will dramatically reduce the chances of ever having a problem with these beautiful and remarkable animals. 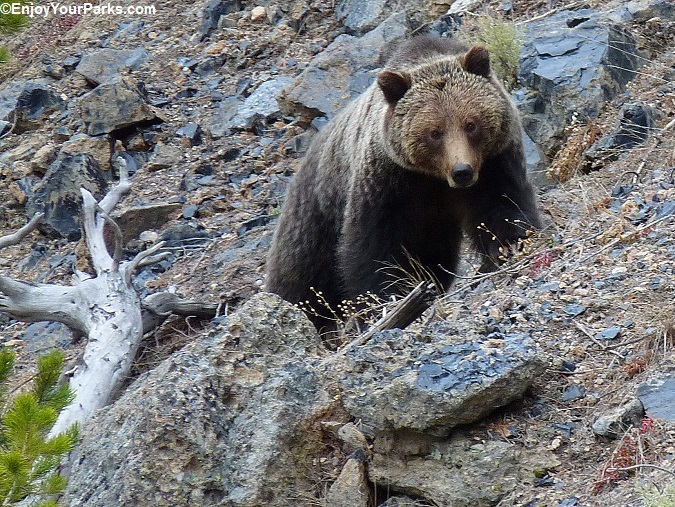 By far more times than not, grizzly bears enhance your hiking experience rather than deter from it. Knowing you're hiking in a place that still is home to some of the most magnificent animals in North America is a great feeling (in our opinion) and makes being there even more special. We have learned a thing or two about hiking in grizzly bear country as we have hiked tens of thousands of miles in the past 40+ years in the Northern Rockies. We've never (knock on wood) have ever needed to use our bear spray, and have never experienced a grizzly bear attack. We have, however, experienced some close encounters and several "bluff charges" by grizzly bears, and it's quite stressful. So by avoiding a confrontation, you are avoiding a very negative experience. But sometimes you can do everything right but things still go south. It's as if the grizzly bear didn't get the memo on how it should behave. Well folks, that's because a grizzly bear is unpredictable and may not do what we think it's supposed to do. So not only will we discuss how to avoid a grizzly bear encounter, but we'll also discuss what to do if you actually have a grizzly bear encounter. Studies show that the human voice is the best way to let bears in the area know you're coming and what kind of creature you are. By making your presence known, this will give the bear(s) time to avoid you. Bear bells on the other hand have been shown to create curiosity. So leave the bells at home, and simply talk loud along the trail, and even louder near noisy water or windy days, and blind corners. Often times hikers tend to look at their feet while hiking rather than look in front and around them... Especially if they're tired. Make sure to look far down the trail and to the side of the trail in front of you to avoid a close encounter with a bear that might not see or hear you coming. This holds true for any hiking in the mountains. In fact it's one of the cardinal rules of the mountains. Also, the larger your group, the less likelihood of a problem with bears. Hiking in a group of two is far better than a single hiker, but the NPS recommends hiking in groups of three or more. Bears are far less likely to be aggressive toward a group of people versus a single hiker. Everyone in the hiking party needs to have their own bear spray, and it needs to be on their backpack hip strap or chest strap... In other words, have the spray readily available instead of buried in your pack. The likelihood of ever needing it if you talk loud and hike in groups is extremely remote, but you must be prepared nevertheless. Again, it's not rare if it's happening to you. It doesn't do anyone any good to carry bear spray if they don't know how and when to use it. Therefore, learn HOW and WHEN to use your spray before you go hiking. We'll discuss the "How" and the "When" later in this section. By following these five recommendations listed above, you are significantly reducing the chances of a problem with a grizzly bear on the trail. Again, we've hiked tens of thousands of miles in grizzly country over the past 40+ years, and fortunately have never needed to discharge our bear spray... because we follow our own advice. Grizzly bear along a trail in Glacier National Park. When an animal such as an elk, buffalo (bison), bighorn, deer, moose for example, dies of natural causes or is killed by a predator such as a grizzly bear or wolf, the carcass will soon be "owned" by a grizzly bear or a group of grizzlies until nothing remains but the animal's bones and maybe its hide. While there is still edible remains, grizzly bears will periodically feed on the animal and then stay close by it to nap. But this "nap" involves "one eye open", and if another predator or unsuspecting hiker gets near it, the "napping" bear will turn into a raging nightmare and come charging at whatever it thinks is trying to take over the ownership of the carcass. This is a very, very, very bad situation and is why hikers need to be aware of their surroundings constantly so they don't stumble open this dangerous and potentially life-threatening situation. Grizzly bear guarding "his" buffalo carcass in the Yellowstone River. Park Rangers are constantly monitoring the status of the trails in Glacier Park, Yellowstone Park and Grand Teton National Park for carcasses, but they can't be everywhere all of the time. So don't really on trail status reports. You need to always be aware of what's around you and respond accordingly. If you see (or smell) an animal carcass while hiking, get your bear spray in your hand and take off the safety, and then GET THE HECK OUT OF THERE FAST. Do not run, but first back up slowly and then turn around and get completely out of the area immediately. We'll talk about what to do if have a bear encounter later in this section. You know the quote from Shakespeare, "Hell hath no fury like a woman scorned." Well, in grizzly bear country the saying should be, "Hell hath no fury like a grizzly bear sow protecting her cubs". 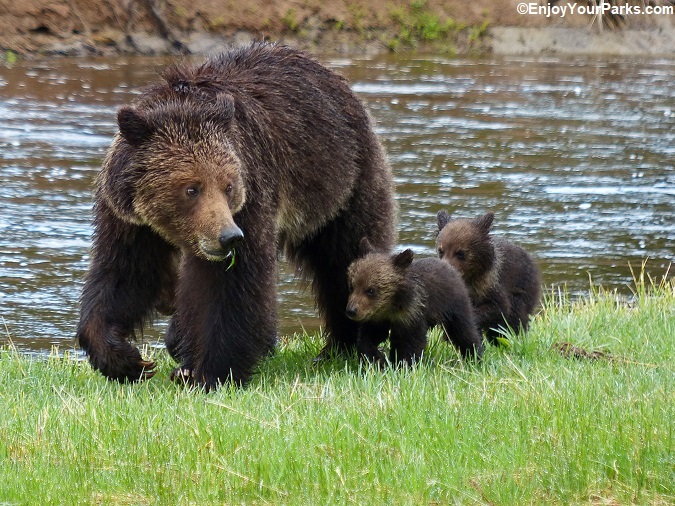 If a mother grizzly bear feels you are endangering her cubs, you are in serious, life-threatening trouble. This situation needs to be avoided at all costs. Grizzly bear sow and cubs. 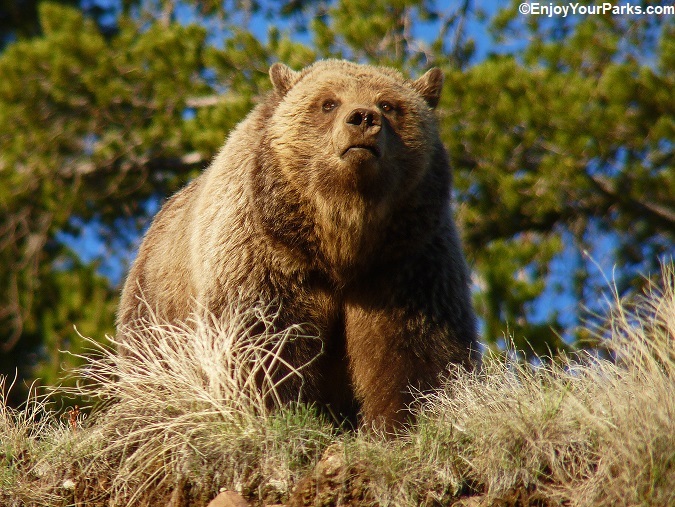 A grizzly bear stalking a human as prey is a very, very rare occurrence, so please don't think that grizzly bears are out there looking for humans to stalk and eat. 99.999% of the time, grizzly bears want nothing to do with humans and will try to avoid them at all costs, provided that human did not surprise them, threaten their cubs or feel you're trying to take their carcass from them. But there have been rare occasions that a grizzly bear (and even black bears) actually stalk a human with the intent of eating them. Even though you have a better chance of getting hit by lightening than this scenario happening, we still need to talk about it later in this section. Grizzly bear not looking happy in Yellowstone National Park. From a distance, seeing a grizzly bear in the wild is one of the “Aha” moments of a person’s life. There is something about seeing these majestic animals on their home turf, doing their thing. In our minds, the grizzly bear is the ultimate symbol of Wilderness, and being a part of this experience is a feeling like no other. But just like you can be enjoying a plane ride until the engine starts to sputter, if a grizzly bear is coming towards you, or if you find yourself staring at each other in close proximity, that “Aha feeling” quickly turns into an “OhNo” feeling. The National Park Service has rules regarding being around animals in our national parks. 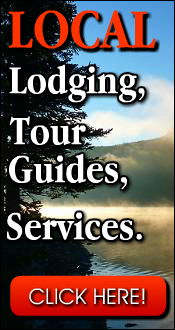 For example, visitors are required to stay at least 25 yards away from buffalo, elk, deer, squirrels, ducks, gophers, etc. 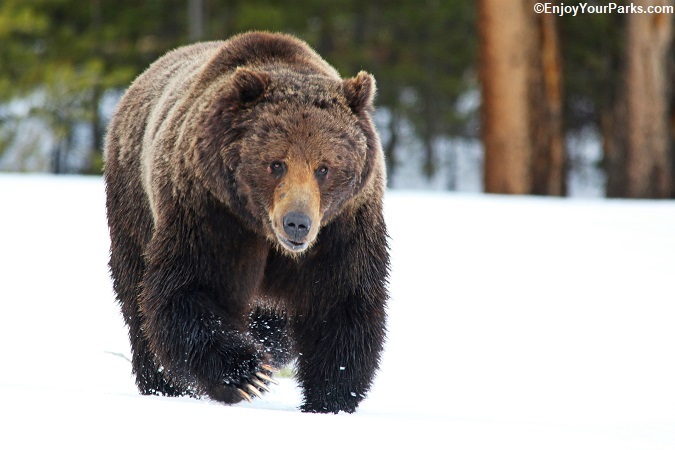 For animals such as wolves, black bear and grizzly bears, the distance increases to 100 yards. But when you’re hiking in grizzly bear country, you might come around a blind corner and end up staring face to face with a grizzly bear 25 yards in front of you. OR WORSE, a grizzly bear doesn’t get the memo about the 100 yard rule and keeps walking toward you, closer and closer without hesitation. In those situations, the “100 rule” goes right out the window. When hiking in grizzly bear country, keep in mind that when you surprise a grizzly bear, or if a bear thinks you’re threatening its cubs, or if you stumble upon a carcass that is being guarded by a grizzly bear or bears, these situations evoke a DEFENSIVE reaction on the part of the grizzly bear, which is handled differently than an OFFENSIVE reaction by a grizzly bear or bears. A defensive reaction by a grizzly bear occurs when it feels you are threatening it or its cubs or carcass. If you find yourself surprising a grizzly bear, or appearing to threaten its cubs, or appear to be threatening its carcass.... And it is not coming towards you but instead is staring at you... STAY CALM, DO NOT MAKE ANY SUDDEN MOVEMENTS, DO NOT RUN, AND BEGIN TO BACK AWAY VERY VERY SLOWLY, FACING THE BEAR. Also, do not make direct eye contact with a grizzly bear as it may interprete this as threatening. You should also try and talk very softly a calmly to the bear by saying something like, “Hello nice bear. Hello there. I’ll be going now... Nice bear. Nice bear...” This will help the bear determine that you are a human. If the bear appears to be agitated by your voice, stop talking immediately and keep slowly backing up. If the bear seems agitated by your movement, stop backing up and remain very still. Author's Note: We've been bluff charged several times in our lives by grizzly bears. It's not a pleasant experience to say the least. Approaching grizzly bear in Yellowstone Park. If the grizzly bear isn’t bluffing and makes contact with you with its mouth or claws, immediately fall to the ground and play dead. Roll up in a “fetal” position, with your hands placed behind your head. Try to keep your back exposed to the bear rather than your stomach. If you’re wearing your pack, the pack is actually reducing injury to your back and neck. If the bear rolls you over to your stomach, do what you can to roll back over to keep the bear from being able to get to your stomach region, as that’s where some serious injuries can occur very very quickly with one bite or swipe. Keep in mind that this is a DEFENSIVE REACTION, so once the grizzly bear feels you are no longer a threat (as you continue to play dead), the bear will probably back off. Do not make any noise or move in anyway until you are certain the bear has left the immediate vicinity. Once the bear appears to be gone, don’t run but get the H_ _ _ out of there., and hopefully you did not sustain substantial and/or life-threatening injuries. WHAT ABOUT MY BEAR SPRAY? We thought you’d never ask. Having a canister of bear spray in your hands, ready to discharge, changes everything. With bear spray, when a bear comes charging at you, whether it’s a bluff charge or a genuine attack, when a bear is about 25 feet away from you, aim the canister slightly downward and give it about a 3 second burst. Then do it again. Then again... until the grizzly bear stops charging and veers off. If the grizzly bear keeps coming and is nearly on you, empty the rest of the canister in its face. Studies show that over 90% of the time, if you use your bear spray properly, you will stop the charge. A grizzly bear’s nose is thousands of times more sensitive than a humans, and one direct whiff of the spray will more than likely stop a bear in its tracks. Again, bear spray used correctly completely shuts the bear down in most documented cases. Now if the wind is strong and in your face, you are going to get some of the spray in your own eyes and nose, which will not be pleasant to say the least. And another problem with high winds in your face is that you must wait until the bear is closer than 25 from you for the spray to be effective. If the winds are strong enough, you may even only achieve effectiveness when the bear is only a few feet from you. NEVER, EVER RUN FROM A BEAR. Grizzly bears can outrun a horse, and can beat the world's fastest 100 meter dash runner by 30 meters. They are extremely quick and extremely fast, and you have absolutely no chance. All you are doing if you run are making things a whole lot worse for youself, as the bear will chase you down and possibly hurt you even more than it originally intended because you kicked in a bunch more bear instincts by running. Running grizzly bear in Glacier National Park. 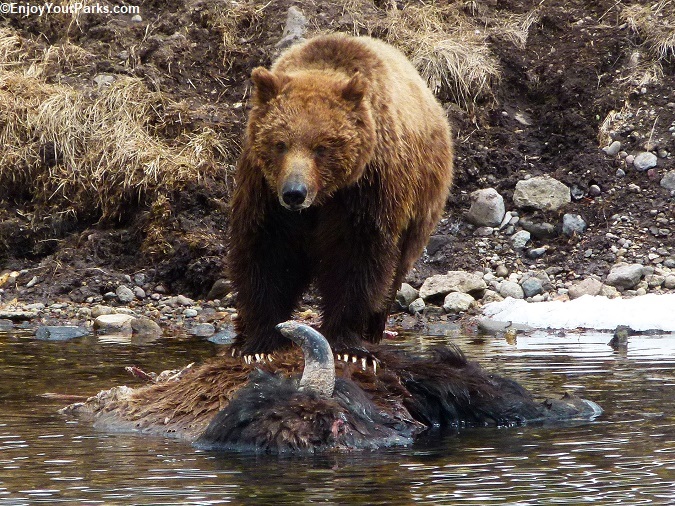 As we talked about earlier, MOST grizzly bear confrontations are a DEFENSIVE REACTION triggered by either surprising the bear(s), appearing to threaten cubs or if the bear(s) think you’re threatening a carcass its guarding. There are rare situations where a grizzly bear will see you as prey, and has the intent on killing you and eating you. THANKFULLY this behavior is rare and highly unlikely... but it has been known to happen, so we need to talk about it. When a grizzly bear sees you as prey, it will behave in a way that is quite different from a defensive reaction. 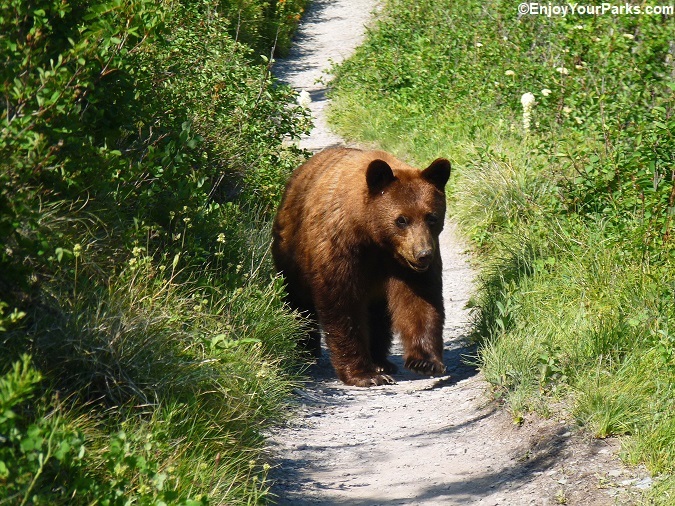 For example, if you're hiking and notice a grizzly bear is off the trail but following you. 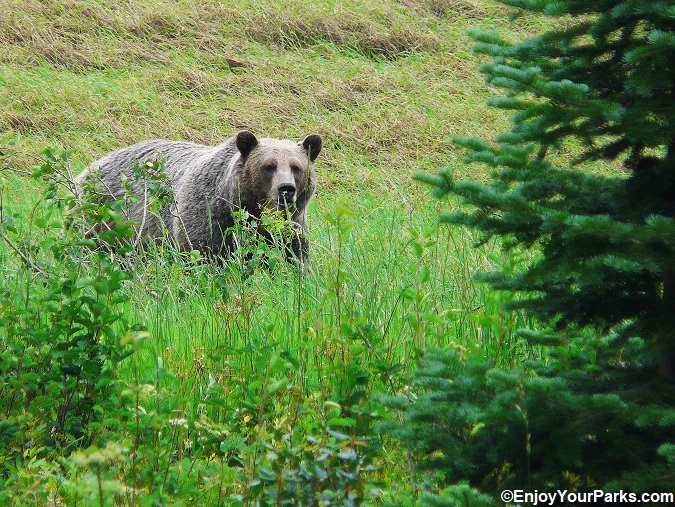 Or if you see a grizzly bear at a certain place on the trail and it leaves, only to show up again further up the trail. These are both signs that the bear is interested in possibly eating you. Another situation where a bear is being predatory rather than defensive is at your back country campsite. If a bear enters your campsite even knowing you’re there, or if it tries to enter your tent with you in it, this is a huge red flag that this bear is behaving offensively and may be looking at you as a meal. Grizzly bear in an aggressive stance in Yellowstone Park. 1) YELL AND SCREAM AT THE BEAR. Louder the better... It's now time to show the bear that YOU are the boss. 2) STAND YOUR GROUND, STAND TALL AND LOOK AS BIG AS YOU CAN. Again, you need to try and intimidate the bear as best as you can. 3) THROW ROCKS OR STICKS AT THE BEAR. Whatever you can throw at the bear, throw it. This is no time to be timid or show intimidation. Approaching grizzly bear.in Yellowstone Park. 1) THROW DOWN YOUR PACK IN FRONT OF YOU AS A DETERRENT. Hopefully the grizzly bear will stop and investigate your pack to give you time to get out of there. 3) IF YOU’RE PHYSICALLY TAKEN DOWN BY THE BEAR, FIGHT FOR YOUR LIFE. Hit the bear, poke its eyes with your fingers, punch the grizzly bear in the nose really hard.... do whatever you can to survive. Whatever you do, DO NOT PLAY DEAD! Instead, fight as if you're life depends on it, because it does. We fully realize that this conversation is stressful and not at all pleasant. Please understand we’re not trying to scare you. Having to deal with a predatory grizzly bear is extremely rare. However, as rare as it may be, it has happened and it can happen. Black bear in Glacier National Park. Great question. Statistically, there are far fewer black bear attacks versus grizzly bear attacks, even though there are about 400,000 black bears in the Continental United States and about 2,000 grizzly bears. 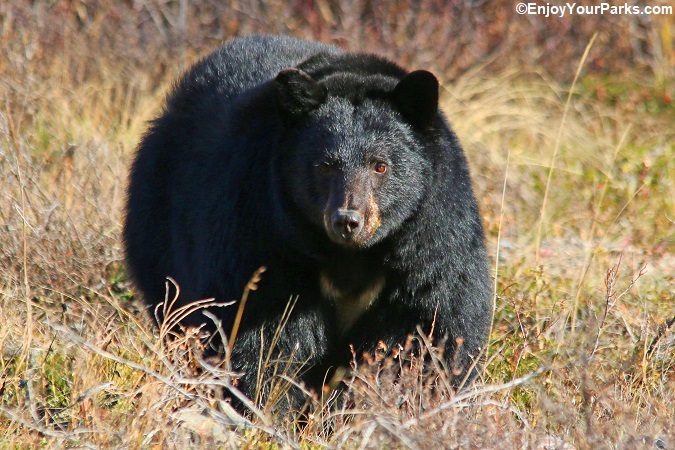 Black bears IN GENERAL are more timid and usually pose less of a threat than their cousin the grizzly bear. Statistics also show that when a black bear decides to attack a human being, the chances of that person being killed or seriously injured are much much higher than during a grizzly bear attack. The reason is that grizzly bears usually attack a human as a defensive reaction and will stop the attack once the threat seems to be taken care of. But when a black bear attacks, its more of an offensive reaction and has the sole intention of killing whatever it is attacking. In other words, black bears tend to play more for keeps than a grizzly bear, even though it's less likely to engage in this behavior than a grizzly bear. BOTTOM LINE: Follow all the advice we gave you on grizzly bears in the above article, and know that if things go wrong with a black bear, things can really go wrong. So take black bears very very seriously. Thankfully, 99.99% when a black bear sees you, it usually high-tails it out of there as fast as it can... with cubs and all. 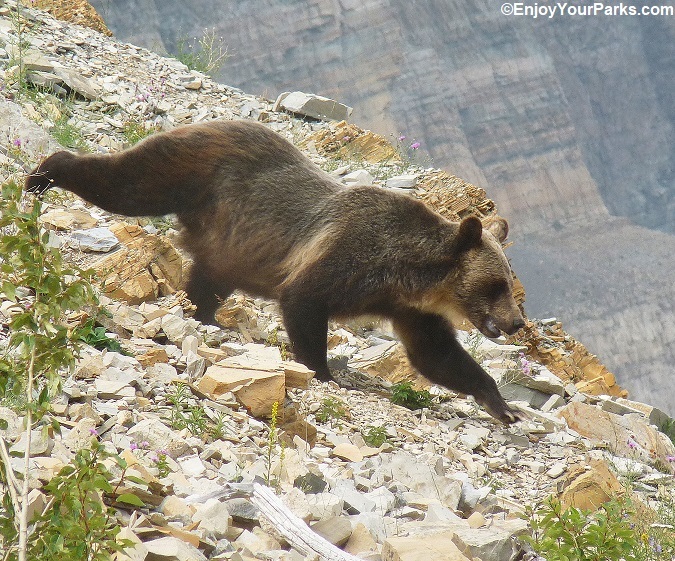 Is this a grizzly bear or a black bear coming down the trail in Glacier Park? Prominent shoulder hump, even when the bear's head is up. Long claws that you can visibly see. No prominent shoulder hump, even when the bear's head is up. Short claws that you can barely see if at all. Longer, more pointed ears than a grizzly bear's ears.. which are shorter and more round. Profile from its forehead to the nose is more of a straight line rather than concave like a grizzly. WHAT ABOUT THE COLOR OF THE BEAR? Color means nothing when trying to distinguish whether you're looking at a grizzly bear or a black bear. Both grizzly bears and black bears can be blonde, black, dark brown, fudge, cinnamon, and everything in between. Anything can happen when you hike around grizzly bears (and black bears), and that's why we spend the time writing this page for you. But in general, most grizzly bears and black bears want absolutely NOTHING to do with you, and if you give them a "heads up" that you're in the area by talking loud, nearly every time the bear or bears will do what they can to avoid you. Most bears do not see humans as food, and they don't see humans as a threat unless you surprise them, appear to threaten their cubs, or appear to be taking their carcass from them. 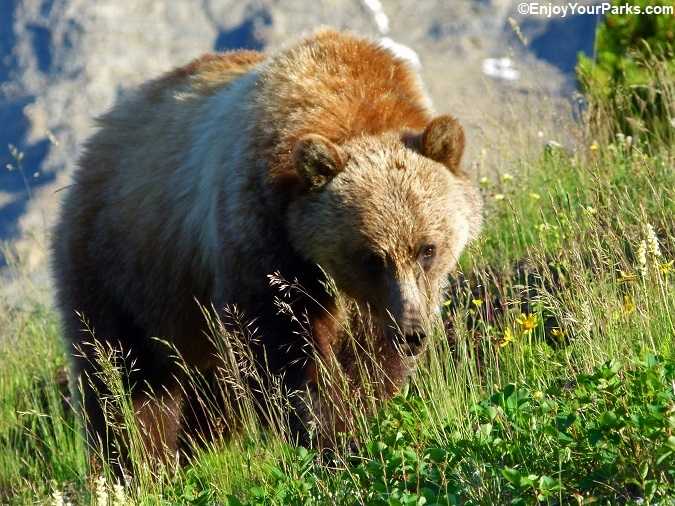 So please enjoy the wonderful experience and privilege of hiking in grizzly country, and follow our simple tips to avoid an encounter.